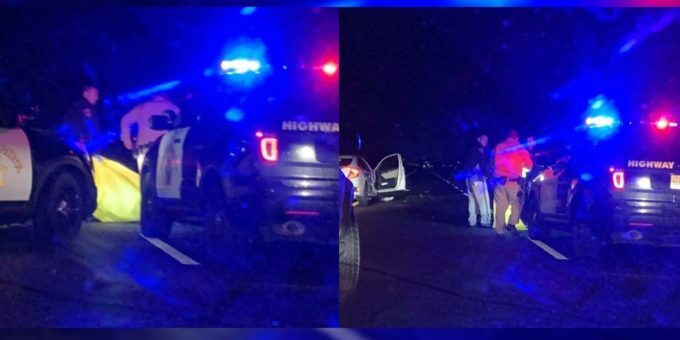 On March 20th, 2019, at approximately 8:38 p.m., a Merced area California Highway Patrol officer heading back to the station from training observed a vehicle swerving in and out of lanes traveling Northbound on Highway 99, just North of 16th street. The officer initiated an enforcement stop near Franklin Avenue exit, the driver of the vehicle yielded to the northbound highway 99 right-hand shoulder. The officer exited his patrol vehicle, approached the vehicle and made contact with the sole occupant of the vehicle. Immediately the officer detected the odor of an Alcoholic beverage and called for additional units to perform a DUI evaluation to the driver. While the officer was waiting for the additional unit to arrive, the driver exited the vehicle and began to run across the northbound lanes. The officer began to pursue the driver in the northbound lanes of traffic in a northwesterly direction, the driver then crossed over the center divider and the southbound lanes of traffic, reaching the southbound shoulder and continued to run in a Northerly direction. The Chp officer crossed the lanes of traffic once it was clear and continued to pursue the driver on foot in a Northerly direction on the southbound shoulder. The officer lost sight of the driver as several big rigs passed in the #2 lane. The officer then observed the driver run across the lanes in a northeasterly direction, the officer lost sight of the driver, then heard a collision. After traffic cleared the officer saw the driver of the suspect vehicle lying face down in the middle of the #1 and #2 lanes. The officer stopped traffic, an additional unit arrived on scene and performed life-saving measures to the driver for approximately 5 minutes. Riggs ambulance arrived on scene and continued life-saving measures, Riggs then declared the driver deceased according to officer Tipler from the Merced CHP office. This accident is still under investigation, the name of the deceased won’t be released till notification of next of kin. CHP is asking if you witnessed anything on the northbound or southbound lanes around this time to please call 209-356-6600.